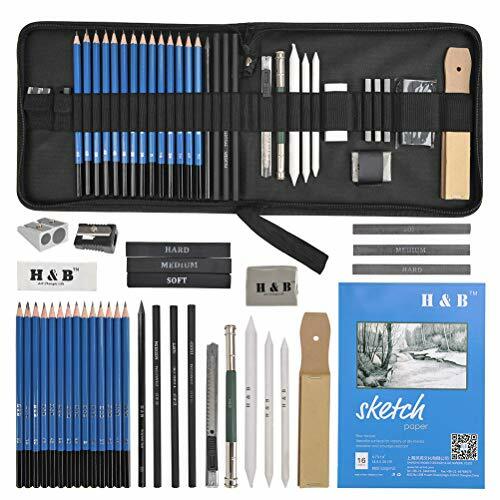 【A Wide Variety of Pencils】Drawing pencils include 8B, 6B, 5B, 2x4B, 3B, 2x2B, B, HB, 2H, 3H, 4H and 5H, charcoal pencils & sticks and graphite sticks with different hardness: soft/ medium/ hard, grant you all ranges of shades and enhance your sketching technique. It is suitable for beginners and professional artists. 【Safe and Non-toxic】 Pencils and tools are made of environmentally friendly materials. After TUV tests, they are acid-free and non-toxic. They can safely use with family and children. The pencil is completely glued to the wood and has a long service life. 【Ideal Gift】 This organized artwork package is suitable for children and adults(Not recommended for kids under 3 yrs). It is ideal for craft or construction paper, students with detailed sketches and advanced art techniques, and even scrapbook lovers.Suitable for Christmas, New Year, Birthday, Thanksgiving Day and other important days. If you have any questions about this product by YOTINO, contact us by completing and submitting the form below. If you are looking for a specif part number, please include it with your message.